This Single Malt belongs to the famous Classic Malts Selection and is one of the most distinguished and interesting spirits of Speyside. Nestled by the famous salmon river, Cragganmore is the ultimate amabassador of Speyside's spirits for many whisky lovers. A superbly rich and sophisticated whisky, layered with aromas and flavours with a smoke puff in the finish. Whisky expert Michael Jackson considered it as one of the most complex Single Malts in Speyside. 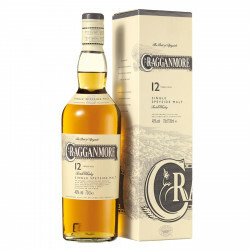 Cragganmore 12 Years Old is a whisky with depth and heavy with fruits, belonging to the famous Classic Malts Range. This selection offers a tour of Scotland's malt whisky producing regions, each one of them expressing the typical nature of its land, through specific character and flavours. For each one of the Single Malts, spring water, soil and time work their magic to capture the essence of a land in a bottle. At the heart of this “golden triangle”, where the Spey and the Avon merges, the famous John Smith founded in 1869 the Cragganmore distillery. His reputation of best distiller in all Speyside was quickly established. Smith conceived atypical stills for its Cragganmore whisky: a flat capital replacing the traditional swan necks, enables the reflux of the heaviest alcoholic vapours, for an even more sublte Single Malt. The unique character of Cragganmore ranks the distillery in the Classic Malts Selection. Created more than 20 years ago, this selection recognises Single Malts crafted in the tradition of iconic distilleries, and offers the most impressive whisky styles Scotland has to offer. Nose: a symphony of mellow aromas, herbs and flowers from the riverside. Heavy fruits mingled with vanilla and honey. Palate: full-bodied with a lovely roundness, a marked flavour of malt over a smoke whiff and sandalwood. Finish: the maltiness fades over subtle notes of wood fire. Comes along perfectly an Abondance cheese or langoustine and lobster. May be served with basil ice for pure freshness.